Sharon Horvath’s personable reprises of maps, sky charts, street plans, garden designs and baseball diamonds have long attracted admirers. Their palette is suave, their details rich, their motifs abstracted yet familiar. But they have often seemed as if more could have been made of them. Indeed. Last year, a grant took Ms. Horvath to India for the first time, with transformative results. Her motifs and color schemes have exploded, going decidedly cosmic, as suggested by “Cosmicomics,” the show’s title (from Italo Calvino). In a smaller gallery, multimedia drawings on Indian ledger paper found in Varanasi illuminate her transition. 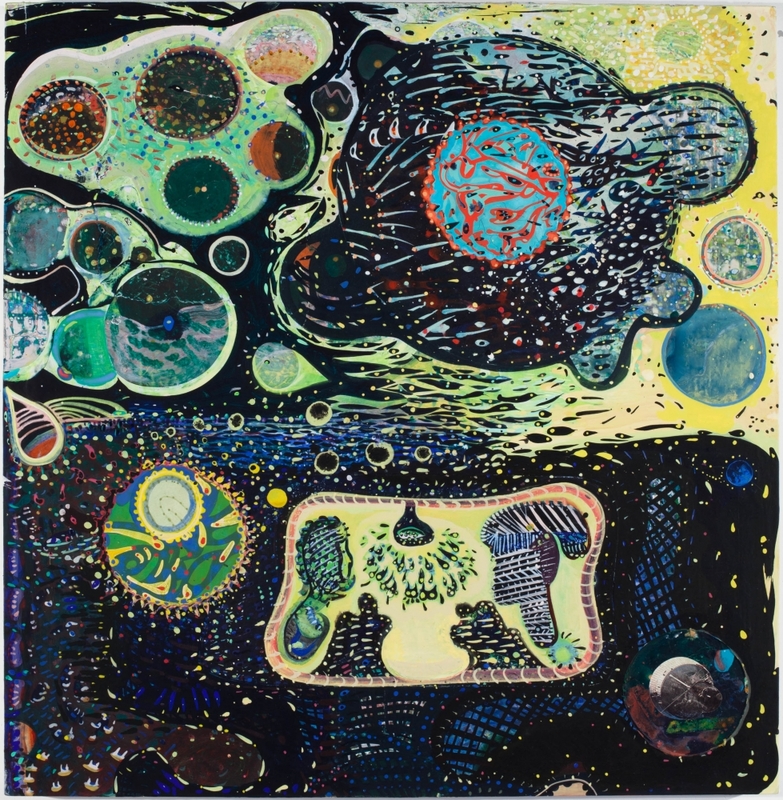 In the paintings, brilliantly colored spheres and biomorphic shapes conjure planets or globes, cells or amoebas, that tumble through dark spaces among nebulae of dots and spatterings. There is much spatial push-pull and alluring details and patterns, with small images cut from old magazines. As usual, Ms. Horvath works fast and thin in pigment and ink on papery surfaces. No matter how delicate or exquisite her minutiae, things never get precious. The combination of reds, oranges, yellows and turquoises against the darker tones evokes influences as various as Tibetan and Tantric art, the early color comic strips of Lyonel Feininger and George Harriman, and the radiant spaceships of the contemporary outsider Ionel Talpazan. Paintings like the red-and-white terrain of “Calvino’s Blood Sea,” the baseball diamond of “T Zero” or the multiple, Hairy-Who-like scenes of “The Distance of the Moon” remind us that Ms. Horvath has plenty else up her sleeve. But what’s clear is that her long cultivation of aspects of cartooning, overlooked art, patterning and lightweight materials found in much painting today has paid off with a combination of concentration and resonance that remains too rare.